WOW! My Memorial Day weekend looks a lot different than it did last year! At this time exact moment last year, I was running, sweating, and probably dropping a few curse words (sorry Mom)! I think Leah may have even been shedding a few tears. I put in over 80 hours that week but I wouldn't change it for the world! It was one of the most EPIC Le Rae weddings to date. Thanks so much to Casey and Jeremy Pruitt for trusting us with your day! Over two years ago, I was honored when I got a "top secret" phone call from a bride to be. Our first order of business was to find the perfect setting for what would be an elegant, southern soiree. I think we can all agree by the picture below we nailed that task! Hello Winton Blount Estate! There is a gorgeous little chapel on the property that looks as if it was airlifted from Europe and dropped in a field in Montgomery, Alabama. This is where they had their first look and ceremony. 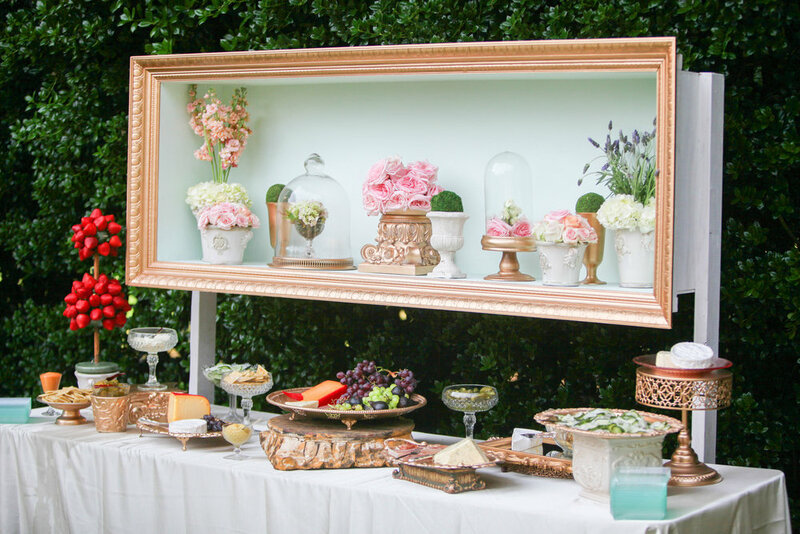 After the ceremony, guests strolled up the driveway and were greeted by tufted couch filled with yummy mini BLTs, fig and goat cheese bruschetta, and a tea cart filled with flavored waters. The rest of the menu by Red's Little School House didn't disappoint either. It was A blast to design and style each of these stations. Fruit, cheeses, homemade pickles, seasoned crackers (Jeremy's favorite), and more looked great under served under these custom boxes made by my hubby! I'm obsessed with the gold molding. A south of the border station with fresh tortilla chips, a variety of salsas, queso. it also included a chef preparing fresh guacamole for guests and was made complete with red and white wine sangria. GUESTS ENJOYED A DELICIOUS BUFFET OF BAKED HAM, SMOKED TURKEY, SCALLOPED POTATOES, VEGETABLE MEDLEY, FRIED CORNBREAD, AND ROLLS. That chandelier from Special Events Lighting was insane! The mint mirrors were perfect for some of the round table centerpieces. We created a secret dinner for two for them after the ceremony. Whitlee Lusk knocked it out of the park with all of the signage. Peggy McKinney combined with fresh flowers and La Tavola linens equals HEAVEN! Don't you agree? Jeremy isn't a big fan of cake but he does love pecan pie. We created a pecan bar with mini pies, pecan candy, and salted pecans. 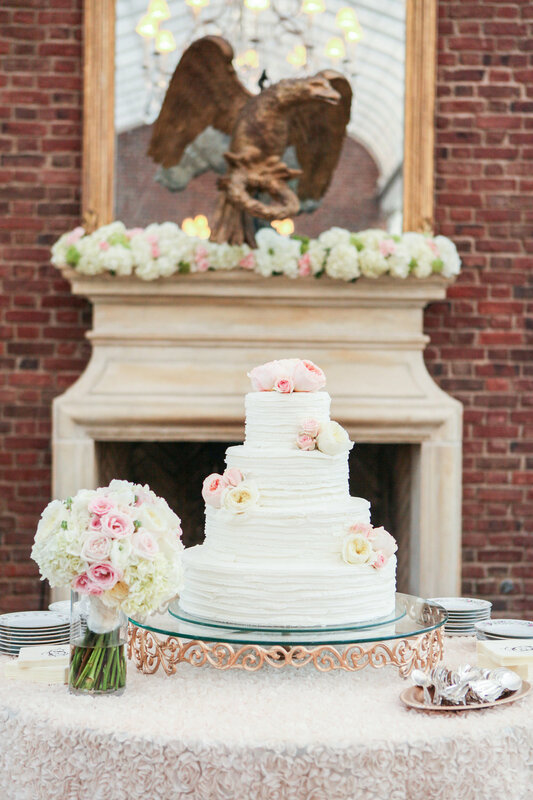 Posted on May 24, 2015 by Rae Culver and filed under Sunday Soirées, Wedding Fabulousness and tagged southern food southern wedding mint wedding pastel wedding garden roses Heidi Elnora gown wes roberts photography #teamawesome Le Rae Events and Design Montgomery weddings montgomery alabama wedding designer unique bar ideas Unique Stations winton blount estate A.G. Lighting Special Events Lighting Brendle Rentals Peggy McKinney Cakes La Tavola Linens.